Property Size 3,704 sq. ft. This multi-level, ski-in/ski-out home is such a find. Banks of windows give way to the amazing valley views. Open and bright defines the entrance to this home. 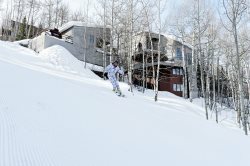 This treasure overlooks Snowmass Village with ski access to Fanny Hill. The main floor entrance breaks into a large living room with breathtaking views and a great deck. There is a large flat panel TV, loads of seating with large over stuffed couches, and chairs along with a wet bar to help you relax after a long day on the slopes. On this same main level is a large, modern, fully equipped kitchen, a large dining table for the whole family and living room area with a big rock fireplace. A full deck wraps around the front of the house.This house is perfect for entertaining or relaxing with a large group. The upper level has 2 master bedrooms with a private bath and a king size bed in each. One of the rooms has a flat screen TV. The first lower level includes 2 bedrooms, 2 baths and a common living room with a large flat screen TV and 2 pullout couches to fit even more family and friends. The first bedroom has a queen size bed with an adjoining large bathroom. The second bedroom is adjoined to the same bathroom and has 3 twin beds. This level also has the washer and dryer units. The lower level consists of a bedroom with a queen bed and full bath. The ski and hot tub access is located on this level. The entire house is equipped with broadband wireless.